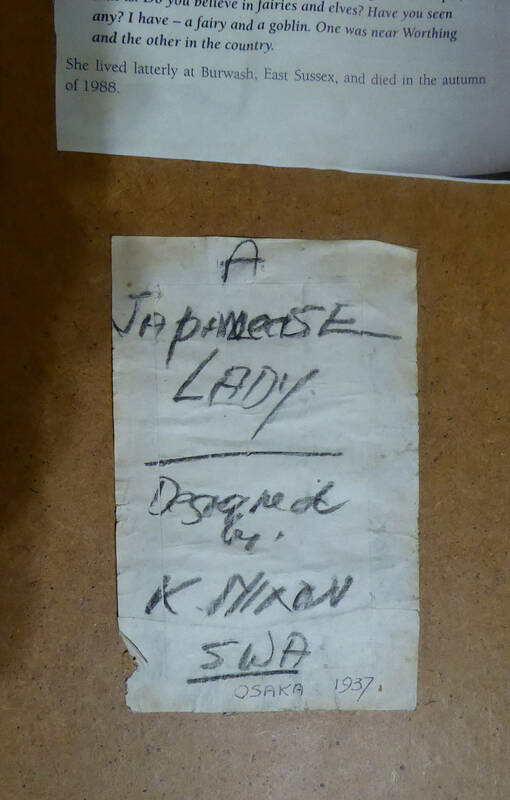 This is a very rare study of a Japanese Geisha which was made by the artist Kay Nixon (Kathleen Irene Nixon) (1895 - 1988). 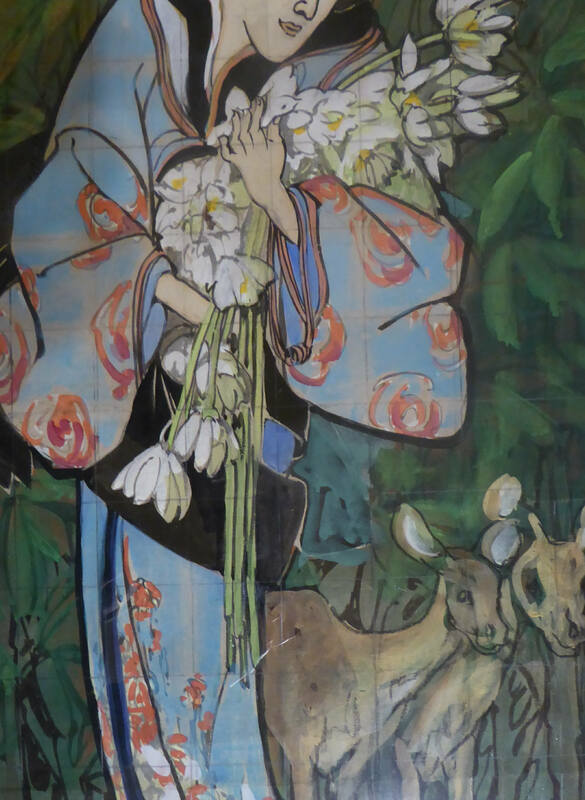 She was a talented British animal illustrator who was often inspired by the art of Japanese woodblock artists. She was born in 1895 at Woodside Park in North London and studied at Camden School of Art. At the age of 18 she took a course in illustration at Birmingham School of Art. She worked for 15 years as a commercial artist - and illustrated numerous stories for Enid Blyton. Her book illustrations included - the interior of The Animal Book, The Adventures of Binkle and Flip (Newnes 1938) and The Enid Blyton Book of Bunnies (Newnes 1925). She also created illustrations for Blyton's The Boys' and Girls' Annual and The Boys And Girls Story Book Number 2. 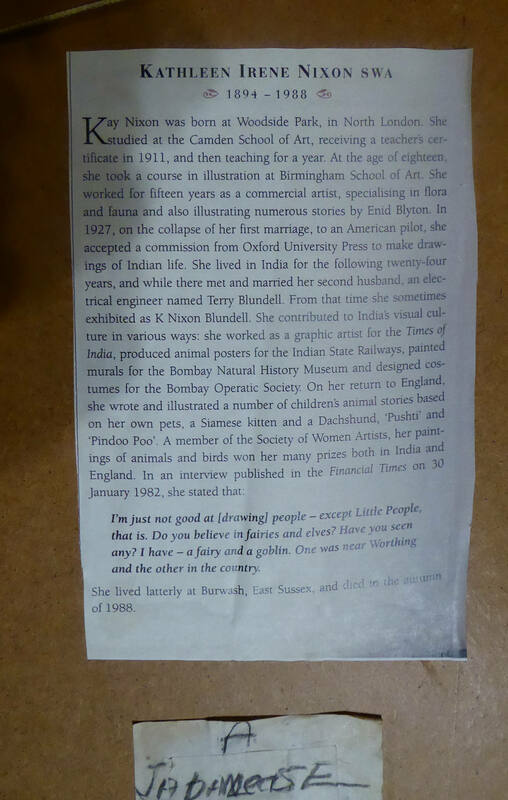 In 1927, she accepted a commision from Oxford Universtiy Press to make drawings of Indian life. She lived in India for some 25 years. She illustrated for the Time of India Press and designed 20 nature posters for the Indian State Railways. 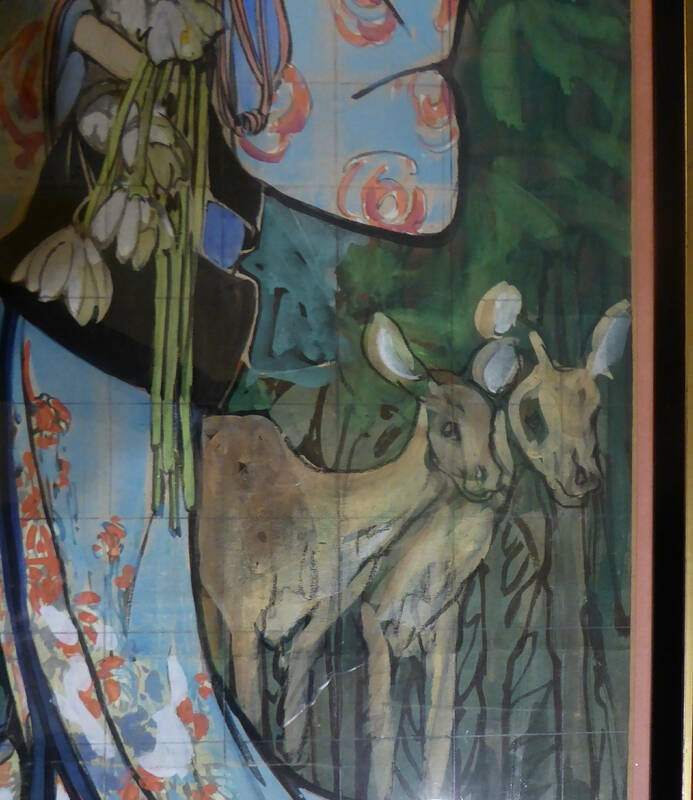 She also painted horse portraits and made a mural of wild ducks for the Bombay Natural History Museum, and also designed costumes for the Bombay Operatic Society. On there return to England, she wrote and illustrated a number of children's animal stories based on her own pets - a Siamese kitten and a Dachshund. Kay's best know illustration is Brer Rabbit and furry farmyard friends. She was the recipient of many awards and medals and made an 'Academic of Italy with Gold Medal' in 1980. She was a member of the Society of Women Artists and her paintings of animals and birds won her many prizes both in India and England. In her later years, she lived at Burwash in East Sussex - and died there in the autumn of 1988. 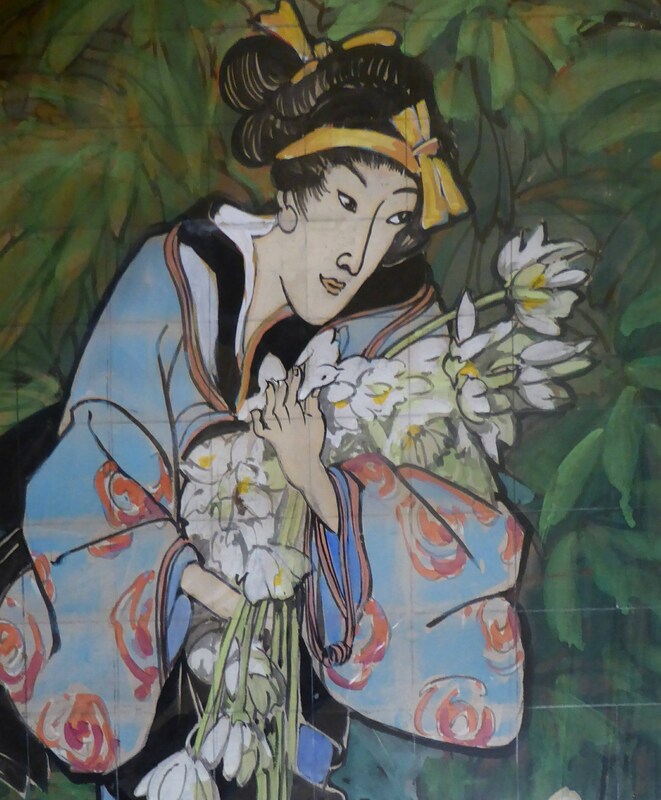 This is a very interesting and most unusual work by her - it shows an image of a Japanese lady. 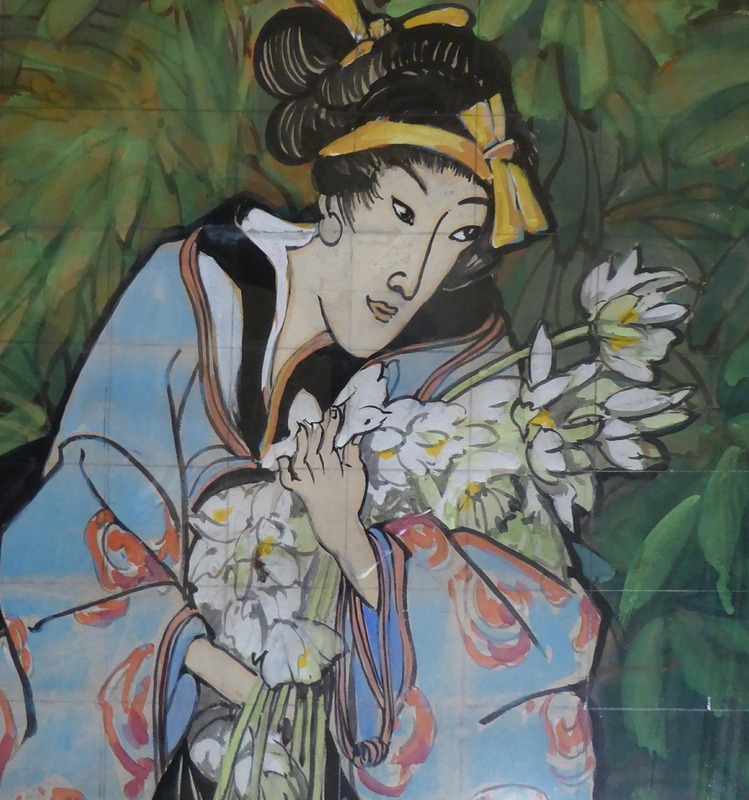 The Geisha holds a big bunch of white lotus flowers in her arms - and is dressed in a beautiful pale blue kimono which falls to a sweeping shape on the ground. She has been in a dense forest - with lush and exotic foliage behind her. To the right-hand side are two deer. 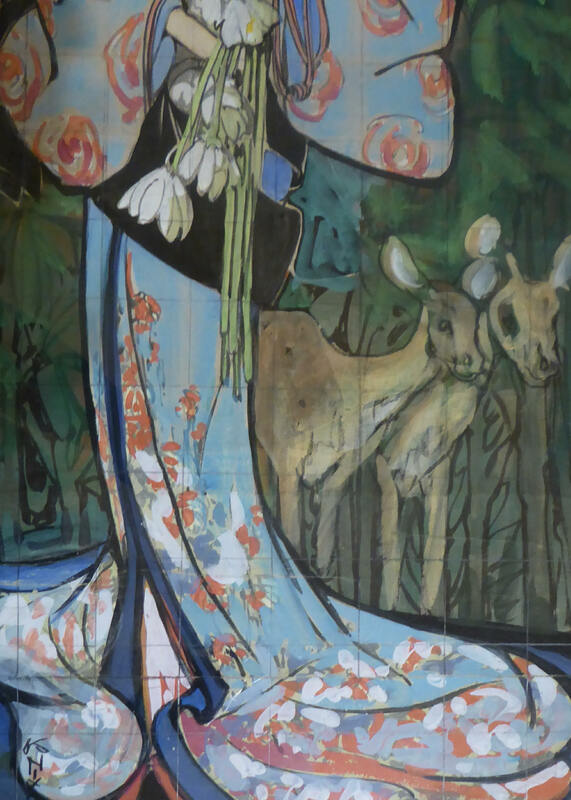 It is very interesting as I think that this might be a very rare study for her for a mural. 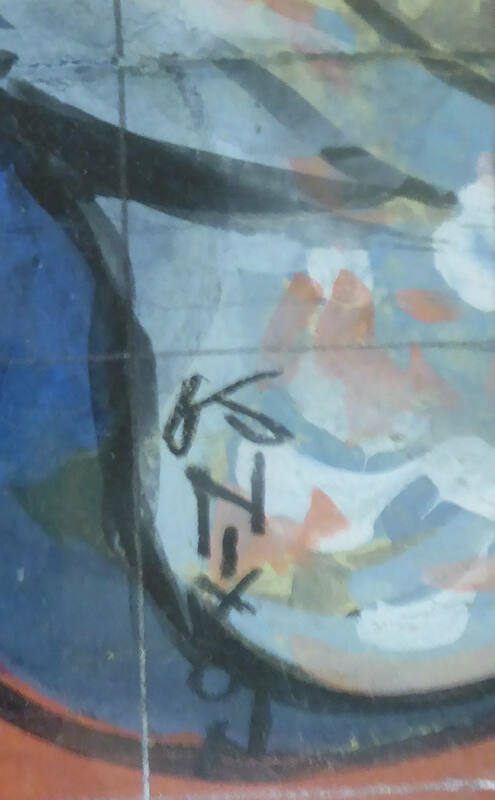 The composition sets out the placement of the figures and it has also been squared for transfer. This happens when an artist makes a smaller working sketch as an initial idea for a larger composition and covers the sketch with a light grid of squares - which helps to copy each square section to a larger area. I have never seen another image like this made by her - and it certainly shows her interest in Japanese Art and Printmaking - it is almost like a woodblock print but made in watercolour. 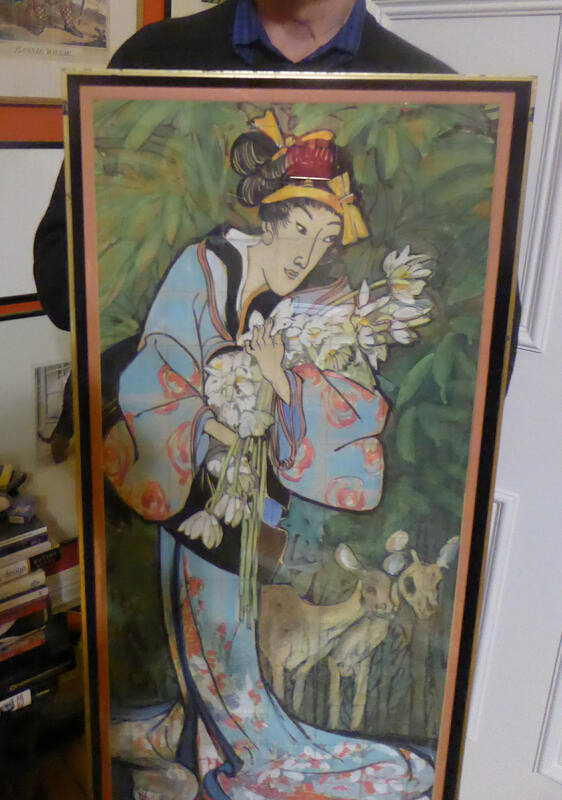 She must have made this on a visit to Japan - it is signed in a "mock" Japanese style, lower left - and on the back of the frame is an old inscription saying this was made in Osaka in 1937. 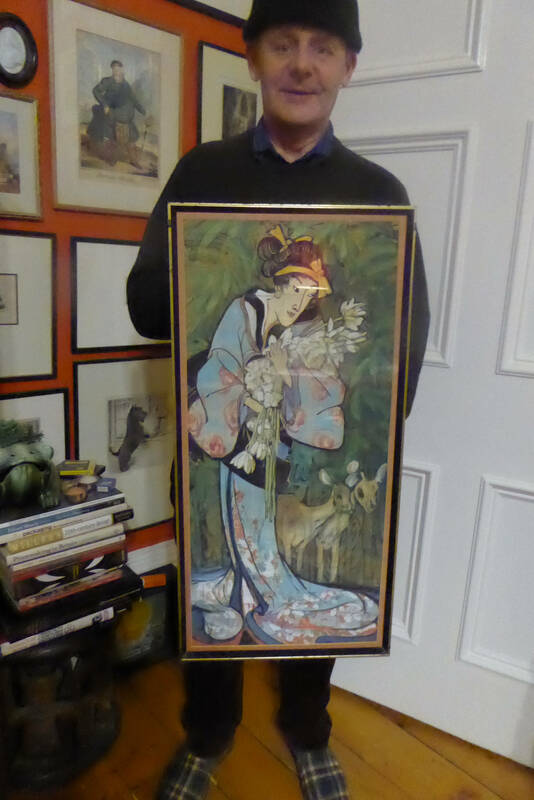 The image is painted in with thick watercolour and gouache on paper - and it is in its original frame. Frame dimensions are: 68 x 33 cm.